What started as me posting a link on my private Facebook page about how much I hate the Transportation Security Administration, quickly turned into a very revealing conversation about race and could be a very large and underlying issue of why we don’t see more people of color in birding or enjoying nature in general. 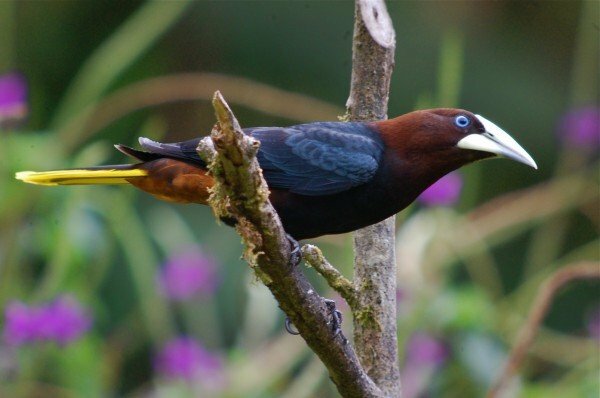 If this is Chestnut-headed Oropendola is from Panama, should I worry that it’s going to steal my camera after I digiscoped its picture? I was taken aback. The TSA is my least favorite government organization, but what is that crack about the mother of the accused all about? I stated that I didn’t think nationality had anything to do with it, people can be jerks/thieves regardless of their nationality. A few other friends left similar comments, some played good cop, some played bad cop, but the bottom line is that we felt that was a racist statement to make about the story. But Starling didn’t stop. Because using a smiley face emoticon makes you less of a racist. Not! I grew up in Indiana and a phrase that I remember hearing was, “I’m not a racist, but have you ever noticed that…” and whatever followed the “but” was the most horrifically racist thing you could imagine. If you have to couch something with an emoticon or “I’m not, but…” that’s trying to give yourself a permission slip to be a jerk. Wow. I travel more than the average bear and I can say that unless I’m in Central America…TSA agents are a mixed bag of race. I would say that most of my interactions have been with white people in the US. I know Starling has done some travel, but not a lot and wouldn’t have a good basis of comparison of all TSA workers. This Red-legged Honeycreeper was hatched in Central America…is he waiting for you to turn your back so it can steal your electronics? Starling is an excellent birder, a young person, someone that I’ve admired as an up and comer and hopeful for the future of birding. But that statement alarmed me. If Starling was brave/foolish enough to reveal that thought process, they can’t be the only person I know who feels that way–they just don’t advertise it on a Facebook wall. It’s been my experience that for every 1 person I know who thinks a certain way, at least 12 others in my circle agree. I wondered, how many other birders out there feel this way, perhaps even on an unconscious level? Are we putting out distrust on the trail without even realizing it? If Starling has been to Central and South America to watch birds, what kind of vibe has been put out by this person when they interact with the guides and hosts down there. Is a distrustful hairy eyeball always on the guides even while Starling racks up the lifers? One of the biggest and more recent face palm incidents with law enforcement and the outdoors happened in Colorado in 2009 when a large marijuana farm was found growing in Pike National Forest. In a press release, Michael Skinner, a law enforcement officer with the US Forest Service said warning signs of drug trafficking in the parks included, “tortilla packaging, Spam and Tecate beer cans.” He also added that campers who play Spanish music and people speaking Spanish were a sign. If you saw any of this, you were to leave the park immediately and call local law enforcement. If you were of Hispanic decent, would you want to go birding in Colorado if those were warnings being posted on signs and aired in the media? So, I think this conversation is a wake up call to all of us and our attitudes. Is this a vibe we are putting out there in little conversations and chats either in public or online? This can’t stand if we want more people of color to join us. If you hear it, call it out like it is: racism. For the record, I’ve only ever had one theft from airport security and that was my Go Girl when I was in Kazakhstan…and their staff was neither black nor Mexican. This post makes some great points. The attitude of the birding community can go a long way toward making people of color feel welcome- especially when there’s already an intimidation factor for birders of color venturing into predominantly white, rural areas. Something to think about. I really appreciated this article, Sharon. However, this is a problem that extends beyond the community of those that observe and study birds in the wild. There also seems to be a noticeable lack of people of color involved in captive bird welfare as well. I have been involved in captive parrot rescue and adoption for over a decade and I bet during that time we have probably not had more than a half dozen adoption applicants who were of color. I have often wondered about the “why” of that and what we could do to attract more people of color into the captive parrot welfare world. They are most certainly welcome, and Lord knows we could use their help. While race is perhaps an element in the question of why there aren’t more non-“whites” practicing bird watching, socio-economic class and background is every bit as much of one. Demographic studies of bird watchers consistently find a significant portion of them to be middle class or higher with, as would be expected due to the equation that in the U.S. at least economic class equals educational opportunity, higher than average levels of education. As you go up the economic scale in the U.S., the higher one gets, the more pale the people there become. The simple truth is that if one spends all ones time just trying to make economic ends meet, they’re much less likely to expend their time and resources on something as (let’s admit it) ephemeral as watching birds; they simply don’t have that luxury. There are always exceptions, of course – the so-called “bird bums” encountered at refuges, festivals, and other birding hot-spots, are often as poor as church mice; however many are nevertheless the off-spring of solidly middle class families in which the seeds of their passion for birds was allowed to germinate and grow. I’m sure this has something to do with it, though I think a lot of it is also a cultural experience thing. My wife works with and went to school with a lot of black women from urban cultural upbringings that are flabbergasted that we go out into the WOODS and look at birds. We’ve invited at least a couple out on our more casual outings but there’s a fear there…and it’s not a fear of racist white people – it’s a fear of nature. That’s a huge part of the culture of many Americans of any color, but it’s especially prevalent among those who don’t have the opportunities of education or travel that certainly aren’t afforded to many many minority youth. We need to get into the cities, get these kids some bins and get them off the pavement. That said, racism is also a learned behavior and we need to fight that with education as well. I grew up homophobic and now my best birding buddy (other than my birding wife) is an openly gay man that I share hotel rooms with on birding trips. Birding can be a bridge if you let it. Put a learned racist and a black man out in the woods hunting for a black-backed woodpecker and there’s a good chance they’ll be buying each other beers and laughing it up after a few hours (of not finding the damned bird, because they apparently don’t exist). We just need to get them both to go out there. No small task. Thanks for this thought-provoking look at what continues to be a perplexing and complex issue. I can only say with certainty that while the Central American birds in your photos are not at all suspicious (though orpendulas can be as ill-mannered as any icterid), the shots themselves are criminally good! Thanks for tackling this important and difficult topic. I always enjoy reading your stuff and I agree with pretty much everything you said here. However, I would take issue with one thing. It’s technical in a way, but still important. I don’t think the post matches its title. It’s true, in my experience, that birders are about as non-rascist as any group of people I know. It’s also true that at least in the US and Canada, they’re overwhelmingly white. Getting other races into the birding tent is a worthy and difficult project. We’ve got to make headway on it. Your post doesn’t really take up the question your title poses, though. The core of what you write recounts an incident where a birder displayed attitudes that in my opinion were unambiguously, nakedly racist. I think a lot of us who read those posts were shocked, because they were so unusual among birders. I would say that there’s no vibe involved in your core story. Starling made a bunch of ill-considered, indefensibly racist comments. That’s newsworthy precisely because it’s quite unusual. I wholeheartedly agree that it shouldn’t stand and I thought you and many others did a very good job of calling Starling out. I hope he learns something from this episode. I know him to be decent person in most respects and I hope he’ll soon realize, if he doesn’t already, precisely why many of his comments were both offensive and simply unsupported by fact. Your next story of racism and stereotyping isn’t from a birder at all. It’s from a cop (and just to be clear, I don’t think nor do I mean to imply that all or most law enforcement officers are racists). I do see a connection between this story and the issue of diversity among nature fans, in that people of all races should be made to feel welcome on public lands and it’s a problem when they’re not. But it’s a fairly indirect connection, I think. So, if you want to start a conversation about how to make birding more diverse, awesome. And I’ll be the first to say that I think a lot of birder behavior, including dress, customs, etc, while not truly racist, is not at all welcoming to non-whites. We can’t keep doing the same thing and expect different results. And, if you want to tell a story about a rare instance of a birder making racist comments and being roundly and swiftly called on it by other birders, also awesome. But given how contentious and painful the history of race relations is, basically throughout human history, I think it’s very helpful to keep the terms of debate as clear as we can manage. Anyhow, I apologize for that long discourse. As I said, I agree with pretty much everything you said. I look forward to this conversation continuing, to hearing more of your thoughts on the subject, and to building a birding community that is as vibrant and colorful as our society itself. I appreciate your thoughts, Jeff. And I am really working to keep Starling anonymous–they are young, they can learn and hopefully do from this. I think what struck me most about this was it all went down with someone that I thought was pretty cool and I also questioned my behavior and assumptions of people I meet. Though Starling was blatant on a Facebook wall, would they say that out loud if in Central or South America? Or in the Rio Grande Valley? Perhaps not, but maybe a vibe would be given off. Is this something that is heard and discussed in other circles or on other social media walls and not addressed? I don’t think this is the whole reason but I think it may be more of a factor than I ever realized. I appreciate you addressing this important topic. As a birder of color I have often faced suspicion and fear when I venture into affluent communities in search of birds. People often don’t realize their local park can provide entirely different experiences for different people. I’ll just recount the tale of Alta Plaza Park in the Pacific Heights neighborhood of San Francisco. A breakdown in cultural connectivity – not being able to say “Hi” to a stranger and engage in conversation. And importantly, a distinct lack of awareness about the natural world – of course I’m going to look suspicious in the bushes if you have no idea about the 7 hummingbirds zipping around me as I’m taking pictures. I let the incident pass until I was questioned by the cops again a few days later. Then, one Sunday morning, I was photographing a young red-tailed hawk (http://kitundu.com/patch) perched on the roof of a church. I heard a man describing me to the police. My height, build, location, color of my jacket etc… He didn’t even have the sense to get out of earshot. I turned to him and said “Sir, can I help you? Do you have any questions for me? Sir? Sir? What are you afraid of? “The police will take care of you!” was his response as he gathered up his dog and ran away. At that point I decided I’d rather watch out for birds and not cops – so I crafted a reply. I didn’t want to be accusatory, but I wanted to draw people’s attention to my experience in the hope that people would shake off the fear and relax. I made a poster and put one on all the streetlights, garbage cans, and on the bulletin board too. The response was heartening. It started a dialogue and turned me into the “bird man,” a small time local personality. Some people felt obligated to come talk to me so that the poster wouldn’t be about them. Others came up to tell me about the fact that they had the police called on them while doing Tai Chi. One woman was so upset with me that I put up the posters, dismissing them as unimportant and saying that “we” take our advisories very seriously. I responded that while light hearted, it was also meant to be taken very seriously. This effect was short lived. The hawk I was following got restless during fall migration and moved on. When I returned to the park several months later to look for the bird which I’d heard had returned, the vibe was back. If you didn’t have a stroller, a dog, a girlfriend/boyfriend, or a walker, you might be the odd one out. It certainly isn’t everyone… but I think we just need to be more open to one another, more curious, sensible and street smart for sure, but way, WAY less fearful. @Walter: That poster is teh awesome. Thanks for sharing your experience and your creativity! I do not understand. If there happens to be a significantly larger correlation factor between “older white folks” and bird-fancying or between homosexuals and aviculture than that between university students and birding or ethnic “minorities” (as recognized by the federal government) and birding, what is the problem? There could be various explanations for such correlations. The data do not imply that there is some underlying discrimination nor that there is an artificial and malicious mechanism in place for attracting only Midwestern grannies to the nature center or homosexuals to the bird club meetings. I mean, we do not have a program for convincing white people to stop wearing shorts and flip-flops all of the time, because the fashion errors of the lesser-melanised do not in any way preclude “ethnic” people from committing them as well. @Walter, awesome flyer! Actually, you raise a good point. Birding can be a solo activity for many who choose not make the time and effort to arrange meet-ups with other birders. Therefore, the birding community does not even have an opportunity to discriminate against the soloists. That you received such cold treatment by an entire neighbourhood is a symptom of some serious problem there, but at least the birding community cannot be blamed for that case of sheltered myopia! Thank you for sharing your story. Wow! I really appreciate your perspective on this and I think it reaffirms that all of us need to be curious rather than wary. We’re so discussing this in the podcast tonight. @sara: Seriously? How about if only white people are birders then only white people will think birds worth conserving? Or how about if only white people are using our parks and wild areas then only white people will find them worth preserving? Or how about we think birds are so cool that we want every type of person to enjoy them? Obviously there are a lot of factors at play here. This thread has touched on some of the huge ones including overt racism, disproportionate police attention for harmless actions, economic disparities. I’d like to point out something that I’ve had to learn over and over again – even for a well-meaning white person, it’s easy to forget just how much race can affect a person’s day to day life in ways that aren’t necessarily dramatic, but wear you down over time. @Kirby: I recently read an essay by Evelyn White called “Black Women and Wilderness” that speaks to exactly that topic, but unfortunately it doesn’t seem to be available online. I can’t outline her whole argument but suffice it to say that she argues that there is a cultural tradition of “isolation= increased vulnerability to racism” that impacts African-Americans’ feelings about wilderness even when it isn’t consciously expressed as such. @Walter: Thanks for that story and your strategy for resolving the problem. @sara: Besides what Corey said, bear in mind that there is already a problem with environmentalism being seen only as a boutique issue for naive, mostly-white college kids and Park Slope style liberals (see the navel-gazing of Jonathan Franzen for self-inflicted examples.) That makes it easy for the cynical to set populism and environmentalism against each other, when in fact environmental collapse is a huge danger to the poor, mostly non-white populations of the world, and any sustainable solution to environmental problems also needs to incorporate economic and social justice, since otherwise increasing instability and desperation will just tear down the efforts we’ve made. Also, it’s the right thing to do! That’s enough out of me. I want to close this by pointing out the Urban Science Adventures blog, which I love because it’s full of enthusiasm, focused on education, and talks about race and science alike in a straightforward, unapologetic way: http://urban-science.blogspot.com/ . Some folks here might enjoy it. @Carrie, without addressing the conservation/envrironmentalism connection (because honestly, I am not convinced that bird appreciation alone is necessarily efficacious in those efforts; I am not even certain that the so-called “professional” conservationists have a clue either), I still don’t get it. Why is it “the right thing to do?” Likewise, I have yet to understand what is the motivation to attract more women to the engineering and physics departments at my university, for example. I am not opposed to efforts for worldwide education (e.g. trying to convince the Naga people not to hunt migratory Amur Falcons), but that is not the issue here. Regarding the conservation/environmentalism connection, bird appreciation alone is definitely not necessary, and I am not sure anyone here was suggesting this. 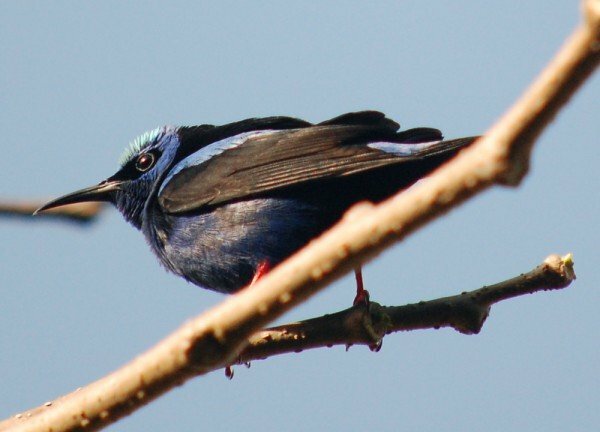 However, bird appreciation often leads to conservation awareness and activity, because bird appreciation leads one to notice the vanishing diversity. Not everyone who is into conservation is necessarily a birder, but the vast majority of birders are into conservation. And if you are not even certain that “professional” conservationists (who do you mean? State authorities or full-time staff of NGOs? Biologists?) have a clue, who do you think has? Farmers? The Oil industry? Other NGOs? Anyone? Who do you think should do the job? I can’t think of anyone, and therefore, I think that Corey’s and Carrie’s arguments are valid. Well, for example because we – as birders or naturalists who are into conservation – think we can work more effectively if we increase in numbers. Therefore, convincing others to join is the right thing to do. This pertains to the entire spectrum of society, from tea party voters to WASPs to minorities. As a consequence, a relatively low percentage of birders / conservationists amongst people of colour demonstrates a high “recruiting potential”. And I think there is more to it, as the low percentage hints towards deeper social factors, likely lower income and lower social and economic security. I have given this some thought and am quite sure these factors are the most important ones, although there certainly are more reasons involved. Of course, ideally these factors should be mitigated and then people of colour would become birders all by themselves. But this is not an ideal world, and social and economic discrepancies within a society aren’t likely to go away anytime soon. Any form of “affirmative action”, be it in birding / nature conservation or regarding women in engineering sciences, could therefore be seen as a necessary evil, a way of fighting a symptom immediately until the underlying problem has been resolved. @Sara: surely you can’t be serious?! The lack of estrogen – as you put it – in physical sciences is a very real problem if you happen to be a woman interested in pursuing a career in this field. It is certainly true that a higher percentage of men are interested in this field in the first place compared to women, but some women will nevertheless be interested, and they will definitely face discrimination. Nature conservation NGOs are “targeting” centres of high population density, and there are NGOs active in China and India and elsewhere. What does that have to do with “handing out binoculars to inner-city African Americans”? And as far as I have followed this post and the comments, no one ever implied that birders were practising some systematic discrimination. I can see that the post’s title may be a bit misleading in this respect, but surely you’ve read the whole piece? Then you state that economic factors are relevant but that these need not be coupled with race and ethnicity. Well, they need not be and should not be, but truth is: they very, very often ARE! And that is a big “underlying problem” in any society. @sara: There are lots of Amish birders. Good ones too. Also, the fact that you see no problem with an all white hobby is part of the problem. Personally, I like my social circles to be less white than a klan rally. Trying to involve people of color in birding activities clearly does not fit in with your “Libertarian” worldview (which you have made clear in previous comments on this blog, like here). I guess we just need to wait for that invisible hand to fix everything, right? @Jochen, the title of the article suggests that there is a lack of “birders of color” (although, as other commenters have noted, the content of the post does not really address the query in the title). If in fact this were due to solely economic factors (which I do not think is absolutely true) then I would understand clearly why birding is not really the priority for those groups. But the original poster does not ask why there are not a lot of lower income birders. And by the way, the fact that I cannot chat with my advisor at the urinal has not affected significantly my endeavors in science. Surely, there are differences: some positive and some negative (probably mostly positive: men like having women around, and there is a biological reason for that! ), but I have the impression that other facets of my personality factor more heavily than my gender. I have offer an addendum to my comment and an injection of hopefulness and positivity. Racism exists in this country and so do birders. I feel that there must be racist birders out there… but I haven’t met them yet. Maybe we don’t travel in the same circles. What I have found, in my limited experience, is that if you care about a chickadee you probably care about me too. Most bird folks I have met have been great people (there are always a few socially inept exceptions to this – but not being attentive to social cues doesn’t make you racist… unless you are truly judging that birds personality by the color of its orbital feathers… jerk!) Anyway, It seems that nice people gravitate towards birds and that is a wonderful thing. As far as the lack of birders of color, I think that is a complex and far-reaching societal issue. If we mend the things that sustain ethnocentrism and greed, fear and selfishness, do our part to weaken the irrationally strong grip nationalism holds on our sense of self, attain a balance in the distribution of resources, and become the inclusive and fair society that we aspire to be (and never quite are), and we STILL don’t have more non-white birders… we can blame the birding community. But for now these issues are bigger than birding, and birders seem as (if not more) sensitive to issues of conservation and general compassion than most. I’m guessing Starling was born and raised in Arizona. Lots of that kind of bogeyman talk here. Thank you for this post that is a good start at unpacking some of the many complex reasons few people of color bird, and are otherwise visible in North American natural spaces. What I like most about this piece is its self reflection and inquiry within the birding community. As an African American, I tire of always having to be “the one” to raise issues of difference. So it is quite refreshing to be an observer and contributor for a change! Please keep the conversation going — even if it exasperates and is difficult. Once we get to the ll species will benefit from it. Once we get to the other side, we will all benefit from it! Thank you for writing about an issue that is so important to the teachers at my school. All our freshmen do the Backpacking Project every spring, where they train to do a week-long hike on the NJ section of the Appalachian Trail. They learn all about Leave No Trace, navigation, first aid, teamwork, and all the wonderful lessons an outdoor experience can provide. Many of them, after graduation, state that “the trail” was one of the most important and formative experiences of their teenage years. Now I can tell you that most of our kids are African American and come from the inner city; this experience is often their first one in nature. Think about how much a positive “trail” experience can do for them in introducing them to conservation, stewardship, and yes, birding! We have had varying responses from other hikers when our kids are on the trail. Some are excited that we are giving kids – any kids, no matter their background or race – a chance to connect with nature and engage it. Some, unfortunately, look at us like we simply don’t belong, or make thinly veiled comments that are racist in nature (those people must think that just because I’m white, I must share their disgraceful views). The best thing about being a teacher is knowing that exposing kids to many ideas and experiences helps them discover their passions and talents. It is just infuriating when someone feels that exposure to certain things is only for certain kinds of kids. Finally, just because I think it is really cool – a few students brought an ovenbird who had hit the window to my classroom for help, and my students sprang into action to make sure it had a safe place to come to its senses. Another group of students applied decals to the windows to reduce bird strikes, and another group built a feeding and watering station. There’s my hope for the next generation of urban conservationists! Sharon, thank you so much for raising this issue, which I have struggled with for many years. As a woman of color and an avid birder, I wish I had a dollar for every ignorant assumption and racist remark I’ve heard come out of the mouths of my ‘liberal’ birder companions. There’s not enough room here for me to go into detail about some of the actions I’ve attempted to get nature lovers/watchers to pay more attention to the importance of greater inclusion to the demographics in the birding community. For now, I’ll just give you a shout-out for sharing your thoughts. I know this is a year old, but I found the comments interesting. I have to say, though, that as a middle-aged white woman, I have had some similar experiences that Walter had with people getting suspicious, thinking I am spying in them or their kids, etc. when I birdwatch or take photos. My binocular’s carrying bag wore out a long time ago, so I openly carry binoculars, but one doesn’t see my camera in my backpack. I haven’t had the police stop me, yet, but I’ve had plenty of people stop and ask me what I am doing. Where I live, I see a lot of non-whites who like to bird or who are interested in birds, but I do think there is an issue of a lack of money and time for many minorities. And, some segments of our society seem very disconnected with nature. Inner city white kids often have the same attitudes towards birding as inner city black or Hispanic kids, I’ve found.